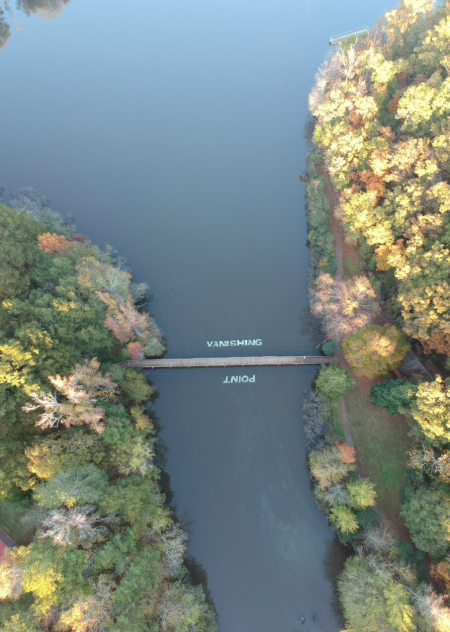 Interdisciplinary artist Clark Lunberry will talk about creating site-specific poetry installations and introduce a new work for the UGA campus. 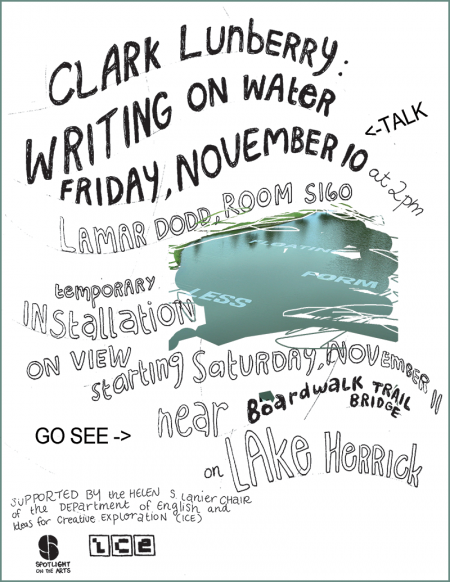 Lunberry is a Professor of English at the University of North Florida and the author of Sites of Performance: Of Time and Memory (Anthem Press 2014) and Writing on Water | Writing on Air (University of North Florida 2016). His large-scale poems placed on water and windows include recent installations in Oxford, England; Paris, France; Toronto, Canada; Tokyo and Hiroshima, Japan; and Stanford University. 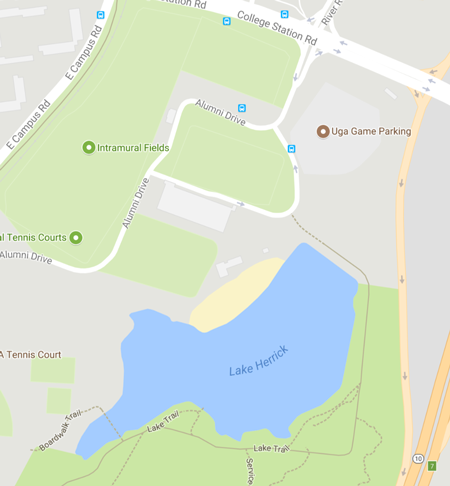 Lunberry will create a temporary installation at Lake Herrick, a prominent feature within Oconee Forest Park, which serves as a living laboratory for research in the natural and social sciences. 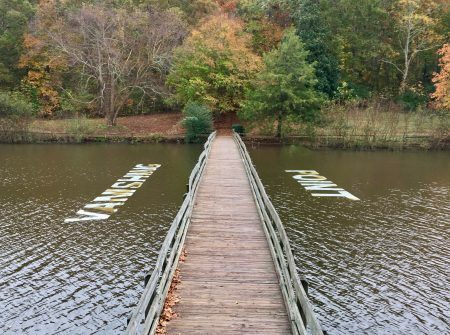 The new work, viewable near the Boardwalk Trail bridge, coincides with a major restoration project at UGA aimed at promoting water quality and enhancing Lake Herrick as an amenity for experiential learning, research, and recreation. For more about the Lake Herrick Watershed Restoration visit sustainability.uga.edu/lakeherrick/. Supported in part by the Helen S. Lanier Chair of the Department of English and ICE. For more information visit clarklunberry.weebly.com/athens-2017.html. 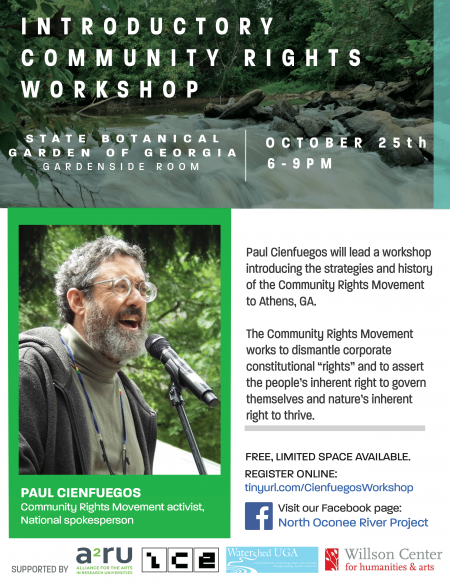 A workshop led by activist Paul Cienfuegos that introduces to Athens the powerful strategies and history of the Community Rights Movement. Since 1999, the Community Rights Movement has helped hundreds of communities pass locally-enforceable laws that promote rights of nature, such as the right of ecosystems to flourish and evolve, democratic rights, such as the right of local community to self-government, and workers’ rights, such as the right to living wages. First introduced to the U.S. by the Community Rights Movement, the “rights of nature” are radical, new laws that grant natural entities, such as rivers, legal personhood, allowing nature for the first time to be represented in court and to effectively fight corporate and governmental threats. Limited spaces are available. 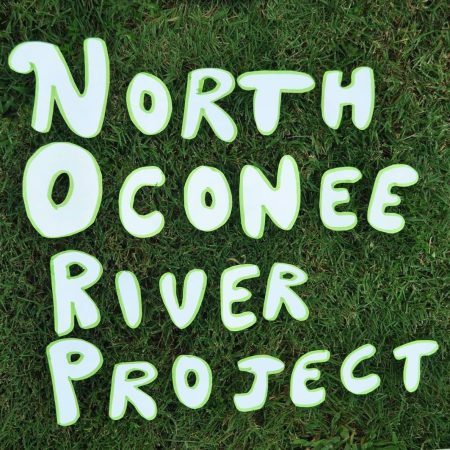 Affiliated with the “Alliance for Arts + Rights of Nature” project funded by an a2ru Student Challenge Grant with additional support from Ideas for Creative Exploration (ICE), Watershed UGA, and the Willson Center for Humanities and Arts a2ru Research Cluster. Normally, bringing out your smartphone at a classical concert is a surefire way to get kicked out, or at least receive some disapproving stares from everyone in the room. Not so at the Yale Concert Band’s next performance, though. When it holds its season-opening concert on October 6th, it’ll want you to keep your phone out for a key segment. The band is performing Cody Brookshire’s “Honeycomb,” which uses any web-capable mobile device as part of the performance — what you see on stage is just one part of a much larger show. 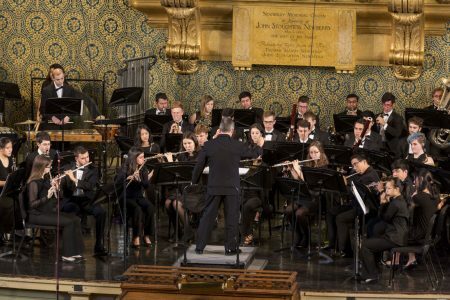 The piece uses SynkroTakt technology to synchronize 32 audio tracks between your phone and the band’s performance with virtually flawless timing. When there’s a call-and-response section, for instance, the audience’s phones will play their part in harmony. It’s effectively adding hundreds of speakers (SynkroTakt can handle 250 or more devices) throughout the concert hall. This isn’t a one-off use. Brookshire has been performing “Honeycomb” elsewhere, and SynkroTakt is useful for just about anywhere that synced audio could add a dramatic effect, such as TV shows and art installations. Just think of Yale’s performance as exposing this invention to a wider audience. Cody Brookshire, Richard Saney, Nick Saney, and Jake Reeves were awarded a 2015 ICE Mini-Grant to create technology allowing for the synchronized streaming of different audio tracks to web-enabled devices for immersive live music. For more information visit www.SynkroTakt.com. C-U-B-E gallery is pleased to feature visual outcomes of an interdisciplinary workshop, unsolved: math+de-sign. 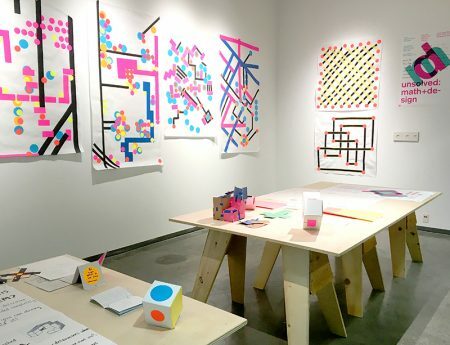 Professors Moon Jung Jang (Art) and David T Gay (Mathematics) created a pilot program for math, art, and design research, with the goal of making a product to be used in math outreach contexts. All the outcomes were produced by design, art, and math students. Supported in part by Ideas for Creative Exploration (ICE).